Lucy Barlow is the owner of Greydogs Swimming Team, called Greydogs, and of the Greydogs Swimming Club. Lucy has been coaching swimming in Somerset West under her own brand since 2001. Greydogs Swimming Team was founded in 2005 and Greydogs Swimming Club was officially registered with Swim South Africa (SSA) in 2011..
Lucy holds a Swim South Africa (SSA) Learn-To-Swim Teaching Certificate as well as a SSA Level 1 Coaching Certificate. She has attended many of the WPA and SSA conferences and workshops over the years as well as the American Swim Coaches Association courses and conferences. 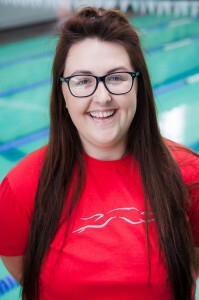 Lucy attended an international coaching course namely the Swim Smooth Course at Sterling University, Scotland, where she learnt how to do underwater Video Stroke-Analysis. Lucy was a very successful and talented swimmer. Her first South Africa record she broke at the age of 8 years old and she went on to break many more Provincial and National age-group records. The strokes she excelled at were Freestyle and Backstroke. She qualified for Senior Nationals throughout her high school years where she also placed. Lucy achieved Springbok colours for Lifesaving and Pentathlon. The highlight of her sporting career was winning two silver medals at the World Lifesaving Championships in 1992 for swimming-related events. Lucy was fortunate enough to be trained and coached and influenced by many exceptional coaches in South Africa and abroad: Libby Burrel, Santa van Jaarsveld, Greg Hodge (Sydney, Australia), National Aquatic Centre (Heidelberg, Germany) and Pierre de Roubaix. Brogan Dannhauser is studying primary school teaching at Stellenbosch University. She has coaching experience having coached previously in Stellenbosch and prior to that in KZN. Brogan connects easily with our GreyPups and has a passion for teaching and children. She is good at setting the boundaries and getting the most out of the swimmers from every lesson. She exhibits patience and compassion towards the swimmers in her coaching. She was a swimmer and is the daughter of a highly respected SA swim coach Delon, from Seagulls Aquatics (had to share that!). Like all the swim coaches at Greydogs/GreyPups, swimming is in Brogan’s blood! We are excited to have her as part of our team. Marusa Mason was a provincial swimmer and swum for the Club “Tomcats”, back in the days. She is new to Greydogs but not new to swimming coaching and teaching. She has coached swimming in Joburg, Hermanus and Somerset West. 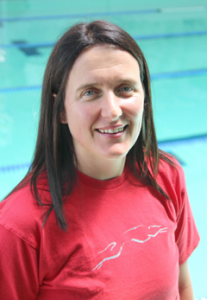 She is experienced with all age groups of swim teaching (learn to swim) and coaching. Her passion for health and fitness extends into personal training and conditioning. She has travelled extensively and globally with Triathlon at World Champs level and representing South Africa and Great Britain. Marusa is also an accomplished Triathlete, Artist and Mother of two! There isn’t a stage in my life I can remember where swimming didn’t form part of my life. From my earliest memories until now, its as though swimming has always been part of my DNA. I attained my provincial and SA schools Swimming Colours from 1982 -1987 and again in 1992. My course experience includes Swim South Africa’s LTS (Learn to Swim) and PBSA (Professional Baby Swimming Association). I have taught swimming since 2000 as well as having the privilege of taking time off to be a stay at home mom to my three wonderful children. I feel very passionate about all aspects of swimming, from teaching swimming and water safety to children and educating parents on water safety, to stroke correction and stroke development. I love being involved with children and building relationships, being part of the process and watching someone grow and develop in their swimming experience, regardless of whether the swimmer becomes a competitive swimmer or swims for pure enjoyment. Im excited to be joining the Greydogs team. I hope to continue to learn and develop to become the best possible teacher and coach with the ambition of bringing out the best in each individual child I work with. I come from Brazil, I started swimming when I was 7 years old. It all started when my brother went to try out for the swimming squad and they picked me from the outside lane. I was a strong medley and long-distance freestyle swimmer. In Brazil we had very strict coaches and we trained 5 hours a day at the country club. My best achievement is a silver medal our regional championships in 200m Butterfly. The club I swam for was the de Regatas Flamengo in Rio de Janerio. I also participated in synchronised swimming and water polo, water is in my blood, I love the water. Sports has always been a part of my life, taking part in karate, gymnastics, ballet and tennis. I really enjoy being around children, as I come from a family of teachers. I hold a Learn to swim and Level 1 coaching certificate from Swim South Africa. My main qualification is an advanced Diplomas in Sports performance training from the exercise and training academy in association with the sports science institute. Working through the Health & racquet club from 1995-2000 I also acquired numerous additional exercise related certificates e.g. fitness management, strength & conditioning, exercise, water aerobics and rehabilitation to name a few.